The Standells’ first major hit single landed on the Cash Box charts and peaked at #8… reached #11 on the Billboard singles charts… dedicated to Boston’s Charles River, the song is beloved by the city of Boston and its sports fans… oddly the song first became a hit in the state of Florida. The ’60s Invasion take us to Grandma’s house because “I Love to Go to Grandma’s House.” More pollution reference?! The Stones could do no wrong back the ’60s. After ‘Satisfaction’ they released this major success reaching number one on the Billboard Hot 100–remained there for two weeks… stayed at No. 1 in the UK Singles Chart for three weeks. Bob Rivers goes Sinatra pastiche with the lounge lizard spin “Hey You! Get Off of My House!” Why!? Seth McFarland, sure, but why Bob? The ’60s Invasion play in more Stones-ish with “Hey Dude (Get off of My Roof).” That’s more sensible. From Sonny and Cher’s debut studio album Look at Us, their single spent three weeks at number 1 on the Billboard Hot 100 in the United States where it sold more than 1 million copies and was certified Gold… also reached number 1 in the United Kingdom and Canada. Kitsch pop music got a big shot in the arm here and has never recovered. 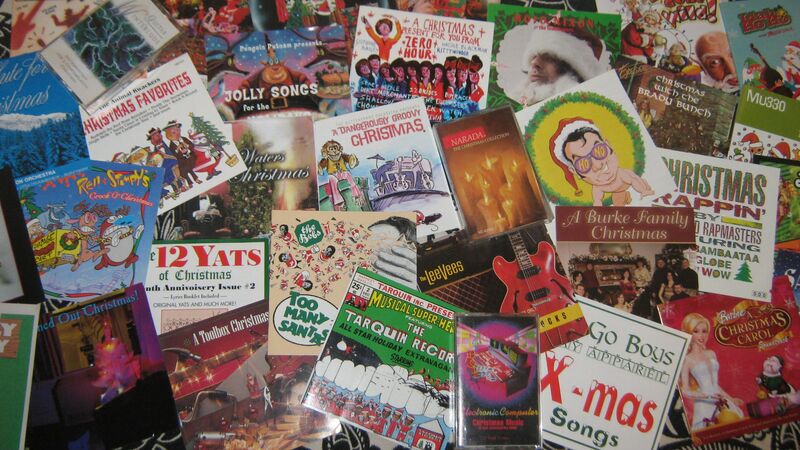 Joel Kopischke goes to town with “I Got Yule Babe” sampling all manner of reindeer games. Have fun! Sam the Sham and the Pharaohs spun up a worldwide success, selling three million copies and reaching No. 2 on the American Hot 100 chart… the first American record to sell a million copies during the British Invasion… stayed in the Hot 100 for a then-impressive 18 weeks… nominated for a Grammy Award… named Billboard’s “Number One Record of the Year” despite never reaching No. 1 on a weekly Hot 100… certified as gold by the RIAA. The 60’s Invasion have some wintery fun with “Merry Christmas” looking out for Santa Claus. What’d Hattie say? The Beatles’ melancholy reflective ode was nominated for six Grammys in total that year, and its album Help! was also nominated in four categories… won the Ivor Novello Award for “Outstanding Song of 1965″… ranked 13th on Rolling Stone’s 2004 list “The 500 Greatest Songs of All Time”… and fourth on the magazine’s list “The Beatles 100 Greatest Songs” (compiled in 2010)… inducted into the Grammy Hall of Fame in 1997… voted the best song of the 20th century in a 1999 BBC Radio 2 poll of music experts and listeners… voted the No. 1 pop song of all time by MTV and Rolling Stone magazine 1998…criticised for being mundane and mawkish… BBC (2012) reported that it remained the fourth most successful song of all-time in terms of royalties paid, having amassed a total of £19.5 million in payments (more than 2,200 cover version) one of the most covered songs in the history of recorded music… after Muzak switched in the 1990s to programs based on commercial recordings, its inventory grew to include about 500 covers… Broadcast Music Incorporated (BMI) asserts that it was performed over seven million times in the 20th century. Yeah, so let’s make some merry! The Mistletones bring their odd parody skills (with glass bells) to “Holidays.” Stresses the right notes. The Mamas and Papas song was not an immediate breakthrough… a radio station in Boston broke the song nationwide… peaked at number 4 in March on both the Billboard Hot 100, lasting 17 weeks, and Cashbox, lasting 20 weeks… certified as a Gold Record (single) by the RIAA… inducted into the Grammy Hall of Fame in 2001… also reached number 23 on the UK charts upon its original release… is #89 in Rolling Stone‘s list of the 500 Greatest Songs of All Time… became a signpost of the California Myth and the arrival of the nascent counterculture era. “Christmas in New England” is The ’60s Invasion’s Currier and Ives take over the river and through the mall. Simon and Garfunkle’s quiet hit hit No. 1 on the Billboard Hot 100 (leading the duo to reunite and hastily record their second album)… a top-ten hit in multiple countries worldwide, among them Australia, Austria, West Germany, Japan and the Netherlands… added to the National Recording Registry in the Library of Congress for being “culturally, historically, or aesthetically important” in 2013. One Hot Second battles the club crowd with the angry parody “Sounds of Christmas.” Cherish the season enough to curse. Louis Armstrong’s massive number reached number one on the U.S. Billboard Hot 100, ending The Beatles’ streak of three number-one hits in a row over 14 consecutive weeks (in addition to holding the second and third chart positions)…the most successful single of Armstrong’s career… spent nine weeks atop the adult contemporary chart… made Armstrong the oldest artist ever to reach #1 on the Hot 100 since its introduction in 1958… the No. 3 song of 1964 as ranked by Billboard… won the Grammy Award for Song of the Year in 1965… and Armstrong received a Grammy for Best Vocal Performance, Male. Just about my fave-o Bob Rivers novelty Christmas song is “He’s So Jolly.” After dozens of listens, it still gets a grin. Roy Orbison spent three weeks at number one on the Billboard Hot 100… the second single by Orbison to top the US charts… Orbison’s third single to top the UK Singles Chart (for a total of three weeks)… ultimately sold seven million copies and marked the high point in Orbison’s career… within months of its release the single was certified gold by the RIAA… Billboard ranked it the number four song of 1964… 1999 the song was honored with a Grammy Hall of Fame Award… named one of the Rock and Roll Hall of Fame‘s 500 Songs that Shaped Rock and Roll… Rolling Stone magazine ranked it #224 on their list of the “500 Greatest Songs of All Time”… 2008 The Library of Congress selected the song for preservation in the National Recording Registry. The Mistletones get silly with divebombing reindeer in “Speedy Reindeer.” Look out!